Gates open every day at 7:00 am, including Sundays and holidays. Gate closing hours change seasonally. Please observe posted times upon entering the Cemetery. Please call the Cemetery Office at 617 524 0128 for the current schedule. Please also note that the Tower Street Walking Gate closes one-half hour before the Main Gate. The Cemetery Office is located next to the main entrance gate, and is open Monday through Friday from 8:30 am to 4:30 pm. On Saturdays the office is open from 8:30 am to 1:00 pm. The Cemetery Office is closed on major holidays except Memorial Day. Please feel free to stop in when the Cemetery Office is open to inquire about specific grave locations, to pick up a map, or to request information on purchasing a grave, or cremation service. The Columbarium is open from 8:30 am – 4:30 pm every day of the week, including weekends, and accessible only with a Keyless Access Card. If you are not a niche owner, or do not possess a card, please call our main office at 617 524 0128, Monday – Friday, 8:30 am – 4:30 pm, or Saturdays 8:30 am – 1:00 pm to gain access. Niche owners may request a Keyless Access Card Application to our Indoor Columbarium. For crematory records, please call the Cemetery Office at 617 524 0128. Once you are at the Cemetery, if you wish to visit a specific section or take a self-guided tour, a detailed map of the Cemetery grounds is available to you at the Cemetery Office, or you may view or download the Cemetery Map. A full color Visitor’s Guide is available at the Visitor’s Kiosk near the Main Gate for a recommended $1 donation to the Forest Hills Educational Trust. The Cemetery grounds are open 365 days a year for visiting. Please see hours posted at the gates. The following schedule is for the Cemetery Office and services. New Year’s Day – Office is closed; no interments. Martin Luther King Jr.’s Birthday – Office is closed; no interments. President’s Day – Office is closed; no interments. Patriots Day — Office open; no interments. Memorial Day — Office open; no interments. Independence Day — Office is closed; no interments. Labor Day — Office is closed; no interments. Columbus Day — Office is closed; no interments. Veteran’s Day – Office is closed; no interments. Thanksgiving Eve – Office closes at 3:00 pm. Thanksgiving Day – Office is closed; no interments. Christmas Eve – Office closes at 1:00 pm. Christmas Day – Office is closed; no interments. New Year’s Eve – Office closes at 3:00 pm. If you require a consultation, please call ahead to make an appointment — we want to make sure we are available to assist you. Call the Cemetery Office at 617 524 0128. 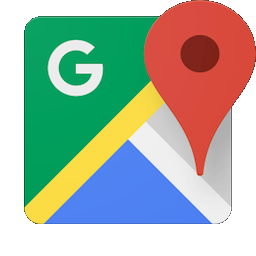 Get Google Maps directions to Forest Hills Cemetery from your location. Take the Orange Line (or various bus lines) to Forest Hills Station. Exit through the Hyde Park exit and use right-hand escalator to reach street level. Cross Washington Street to Tower Street (there is a beauty supply shop at the intersection). Walk one long block to the end of Tower Street and enter Forest Hills’ pedestrian gate. Follow the path as it curves to the left and then turns sharply to the right where you will see the tiled roof of the Forsyth Chapel and Main Office ahead, near greenhouses and a parking area. You are at the back of the building; go through the stone archway to the Main Front Gate and office and chapel entrance. 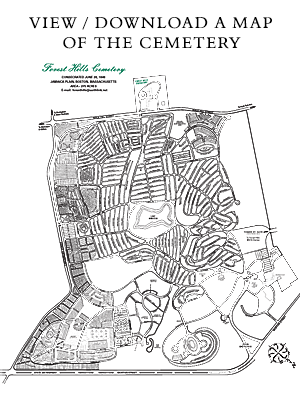 There are many possible routes to Forest Hills Cemetery by car. If you have a preferred route to the Arnold Arboretum or Faulkner Hospital, adapt the last part of the directions below. Take Exit #20A (Route 9 East, Boston and Brookline). Take Route 9 east for approximately 3 miles. Go past the Wegman’s and then take the exit for Hammond Pond Parkway (to West Roxbury and Hyde Park) on the right. Take a right at the end of the exit ramp and go 8/10 of a mile on Hammond Park Parkway through one light to a rotary. Go straight through the rotary (3rd exit – Newton Street). Go 1/3 of a mile past the Putterham Golf Club (on your left), and the road will fork. Bear right onto West Roxbury Parkway. Go up the hill through one set of lights to another rotary. Go 3/4 of the way around and take the 3rd exit at Grove Street. Proceed to the next right, Allandale Road. Take a right onto Allandale. Go 1 mile, past Allandale Farm, to the end of the road at VFW Parkway / Centre Street. Faulkner Hospital will be on your left. Take a left onto Centre Street / VFW Parkway. Go 6/10 of a mile to a rotary; take the first exit off the rotary onto the Arborway – 203 East / Dorchester. Go one mile, passing the Arnold Arboretum Main Entrance (on the right) and passing the Forest Hills MBTA Station. Continue on 203 East to where it becomes Morton Stret. Make a right turn onto Forest Hills Avenue (the cemetery driveway). Continue up the driveway to the main gate and office. You may park along the drive. Take Storrow Drive to the Fenway / Park Drive exit. At the top of the ramp, follow signs to the Riverway / Boylston Street. The ramp will feed you onto Boylston Street. Take Boylston Street (past Fenway Park on the right) through three lights, where Boylston Street flows into Brookline Avenue. Take Brookline Avenue past the hospital district all the way to the Riverway; take a left onto the Riverway. The Riverway will become the Jamaica Way and then the Arborway, and you will pass Jamaica Pond. Stay on the Arborway / Route 203 East and go through a rotary; take the exit marked “Route 203 East to Dorchester.” You will pass the main entrance for the Arnold Arboretum on the right. Continue 1/2 mile past the Arboretum entrance, stay on Rt. 203 East, past the Forest Hills Orange Line MBTA-Station on your right. Continue on Rt. 203 East to Dorchester until it becomes Morton Street and make a right turn onto Forest Hills Avenue (the cemetery driveway). Continue up the driveway to the main entrance. You may park along the drive. From North or South, take Exit #11 (Granite Avenue-Ashmont). Go straight off the exit ramp to the first commercial intersection; a McDonald’s will be on your right, an Irish pub straight ahead. Turn left at that traffic light. You will be on Rt. 203 West-Gallivan Blvd. When you see Norfolk Hardware on your left, Gallivan Blvd. merges into Morton Street (still Rt. 203). Continue straight ahead, across Blue Hill Ave. You will soon see Forest Hills Cemetery on your left. At the traffic light, with cemetery signs on the left, turn left onto Forest Hills Avenue. Continue up the driveway to the main entrance. You may park along the drive.